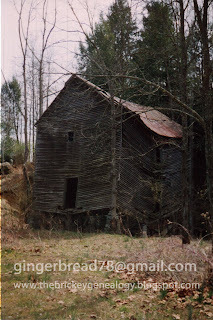 The original Brickey Mill on Stony Creek, north of Ft. Blackmore, in Scott Co., VA, was built about 1845 by Peter Brickey. Peter Brickey ran the mill until his death. After his death the mill fell to his son James Brickey and at his death to his son John Brickey. John traded the mill to George Wolfe who died and left it to his daughter who was a widow Jennings. Mrs. Jennings sold the mill to Will Owens who at his death left it to his son-in-law Graham G. Brickey. The present mill was rebuilt by George Wolfe around 1907-1908. The wheels for this mill were made by James Stewart, who along with his father before him were noted millwrights of the Rye Cove section. Much of the mill machinery is intact and the mill ran until just before World War II. The old water wheel at the back of the building has fallen down and almost rotted away. The mill was operated by an "overshot" wheel with the mill race running from a very large spring further up Stony Creek.